Problem: Wire spool handling is common in most tire manufacturing facilities. There are several issues that can result in repetitive stress injuries. Currently most tire manufacturers have the spools shipped in eye to the sky. This requires the operators to pick up the spool, typically weighing 50 to 90 pounds, and rotate it 90 degrees to place on the spindle. 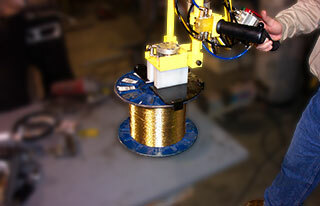 Wire spool rooms are arranged in rows with spindles 3 to 4 high, ranging from 12 inches to 60 inches in height. The range loading from low to the ground to shoulder height can lead to back and shoulder injuries. The rotating of the part 90 degrees results in twisting of the wrist, potentially leading to wrist strain or carpel tunnel injuries. Solution: For the tire industry was an ID (Internal-Diameter) clamp with power rotate tool that can be seen in the video above. The tooling was done with an air balancer to handle the vertical lifting combined with an air cylinder to power rotate the part. This wire spool lifter addresses the concerns for the repetitive stress injuries. The lifting is now done by the air balancer taking the stress off the operators' shoulders and backs. The cylinder handling the powered rotation takes the stress off the wrist. Result: Think special lifting tools can't be productive? 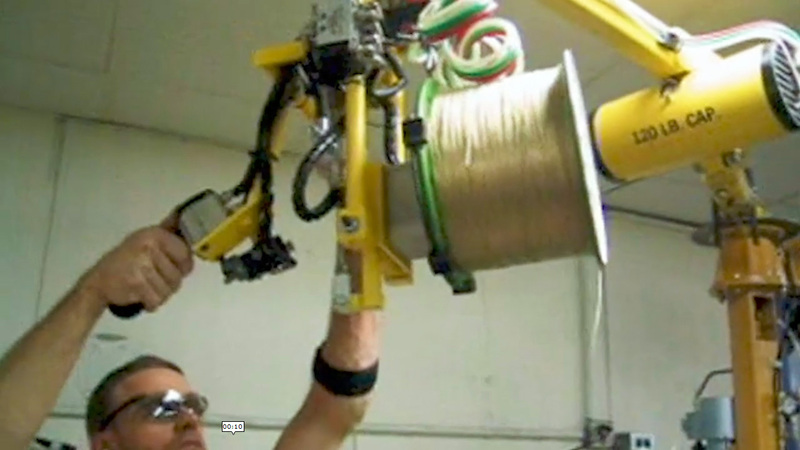 Look at this creel room wire spool lifting device video from Ergonomic Partners. We can design a tool for your job. Contact us for more information.